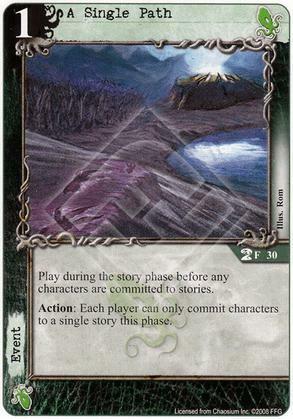 Action: Each player can only commit characters to a single story this phase. Response: After you win an (I) struggle, exhaust Arkham Advertiser Archives to refresh 1 of your domains with 2 or fewer resources attached. Play during your story phase, before characters are committed. Action: Choose a story. Until the end of the phase, if you win an (I) struggle by at least 3 icons at that story, win that story immediately. Attach to a character. Attached character's controller cannot have more than 5 cards in his hand. 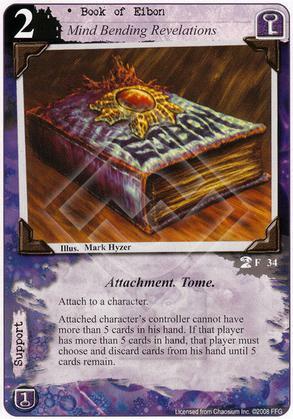 If that player has more than 5 cards in hand, that player must choose and discard cards from his hand until 5 cards remain. Fast. 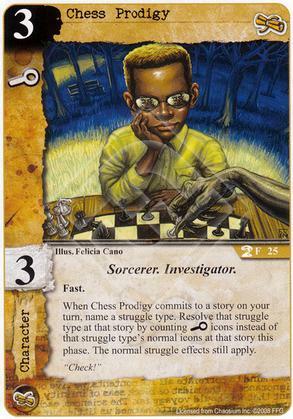 When Chess Prodigy commits to a story on your turn, name a struggle type. Resolve that struggle type at that story by counting I icons instead of that struggle type's normal icons at that story this phase. The normal struggle effects still apply. 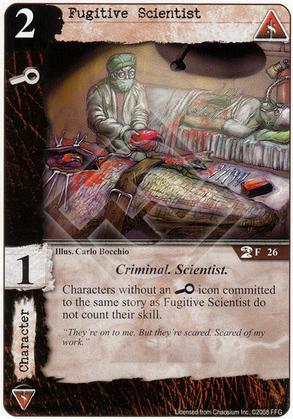 Characters without an (I) icon committed to the same story as Fugitive Scientist do not count their skill. They're on to me. But they're scared. Scared of my work. Attach to a character. 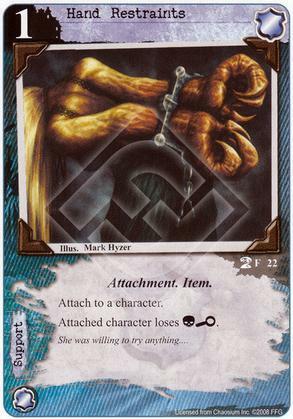 Attached character loses (C)(I). 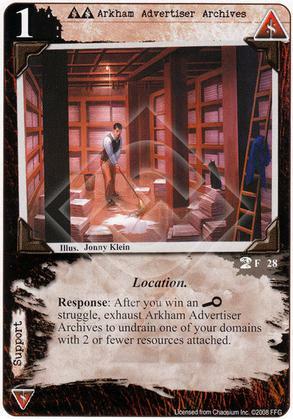 If you would draw a card, you may choose not to draw a card. 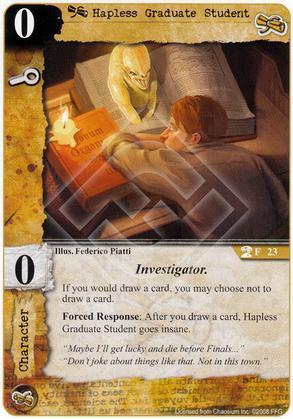 Forced Response: After you draw a card, Hapless Graduate Student goes insane. "Maybe I'll get lucky and die before Finals..." "Don't joke about things like that. Not in this town." 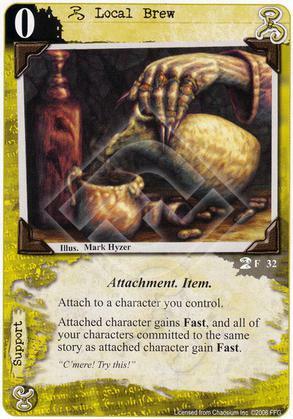 Attach to a character you control. 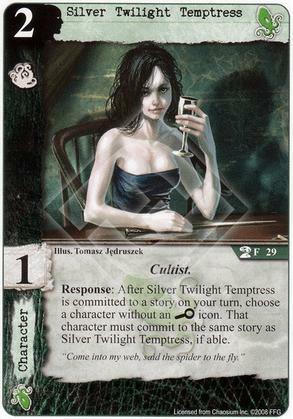 Attached character gains Fast, and all of your characters committed to the same story as attached character gain Fast. Heroic. Toughness +1. Willpower. 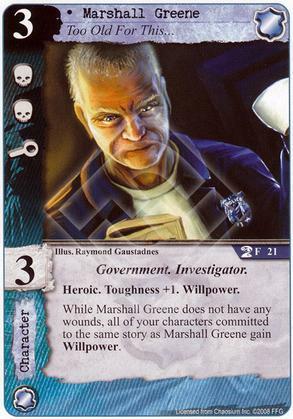 While Marshall Greene does not have any wounds, all of your characters committed to the same story as Marshall Greene gain Willpower. Action: Pay 1 to choose a character with an (I) icon. 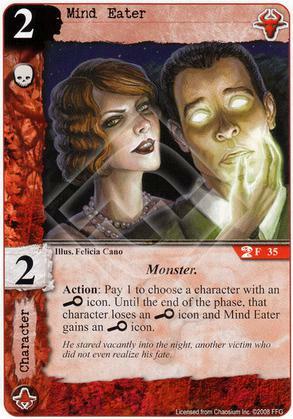 Until the end of the phase, that character loses an (I) icon and Mind Eater gains an (I) icon. He stared vacantly into the night, another victim who did not even realize his fate. 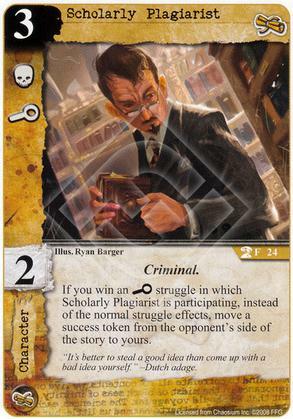 If you win an (I) struggle in which Scholarly Plagiarist is participating, instead of the normal struggle effects, move a success token from the opponent's side of the story to yours. "It's better to steal a good idea than come up with a bad idea yourself." - Dutch adage. "Come into my web, said the spider to the fly." 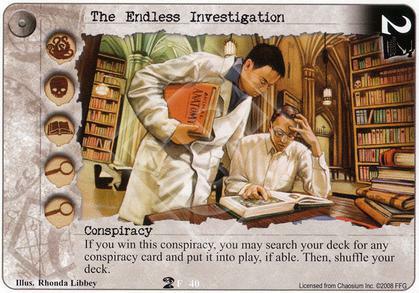 If you win this conspiracy, you may search your deck for any conspiracy card and put it into play, if able. Then, shuffle your deck. 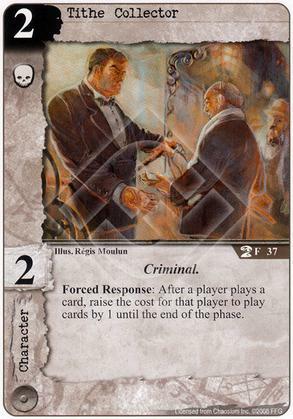 Forced Response: After a player plays a card, raise the cost for that player to play cards by 1 until the end of the phase. 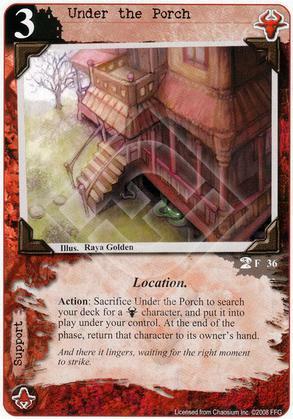 Action: Sacrifice Under the Porch to search your deck for a [Shub-Niggurath] character, and put it into play under your control. At the end of the phase, return that character to its owner's hand. And there it lingers, waiting for the right moment to strike. 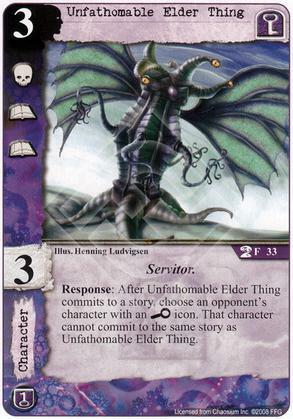 Response: After Unfathomable Elder Thing commits to a story, choose an opponent's character with an (I) icon. 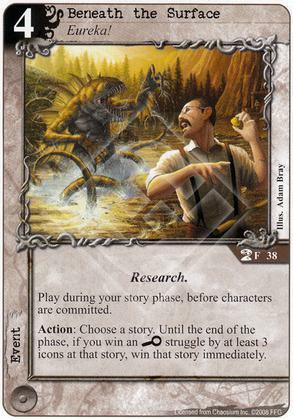 That character cannot commit to the same story as Unfathomable Elder Thing. 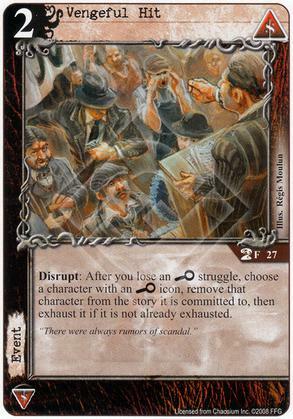 Disrupt: After you lose an (I) struggle, choose a character with an I icon, remove that character from the story it is committed to, then exhaust it if it is not already exhausted. There were always rumors of scandal. 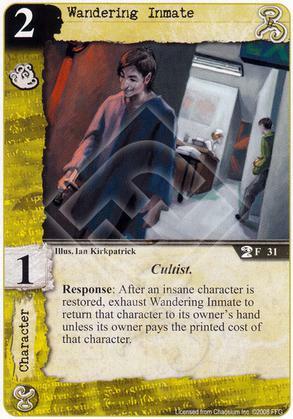 Response: After an insane character is restored, exhaust Wandering Inmate to return that character to its owner's hand unless its owner pays the printed cost of that character. 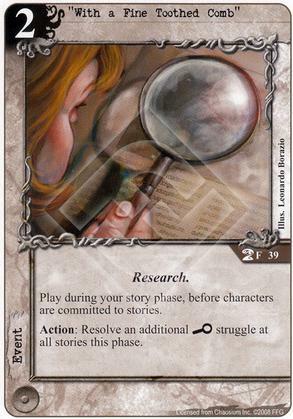 Play during your story phase, before characters are committed to stories. Action: Resolve an additional (I) struggle at all stories this phase.